After dyeing with logwood at the guild last year, I ordered some chips from a tapestry weaver in Sydney; recommended by my dyeing teacher, apparently he imports plant dyestuffs to dye all his own threads (wow!) and then sells what he doesn’t need. 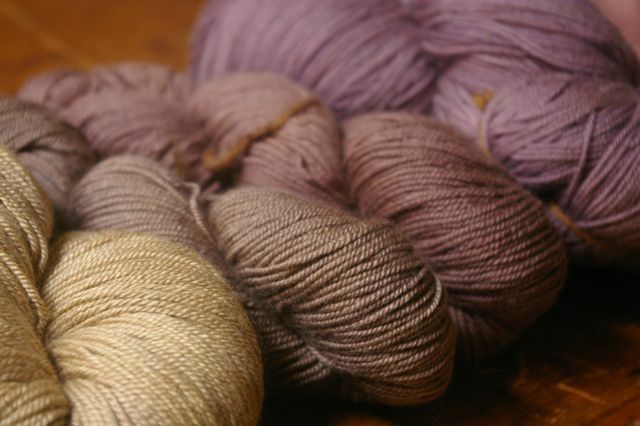 My friend Mel has very generously shared with me a pack of Renaissance dye extracts that included some logwood… so there has been a couple of dyeing sessions to see what colours could be achieved using the two different sources. 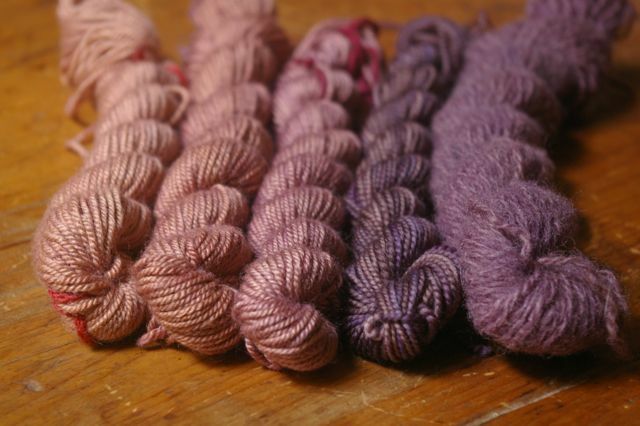 Almost all skeins were pre-mordanted with alum and cream of tartar and I didn’t use any mineral modifiers (such as iron), although the enamel pot I used when dyeing with the extract has a chip in it so I think I may have added some iron into the water that way. Next time, I need to do two batches, one in that one and one in another, to compare results. 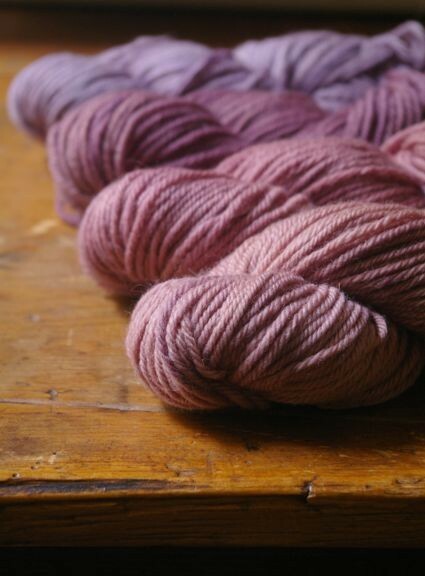 Some of the yarns I used had previously been dyed with other plants and this has just reconfirmed for me that overdyeing gives some of the most interesting and beautiful colours! 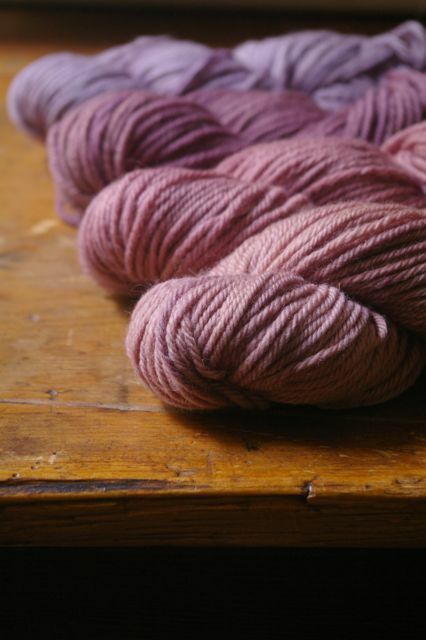 This entry was posted in dyeing, knitting and yarn, plants and tagged dyeing with logwood on October 21, 2012 by admin. 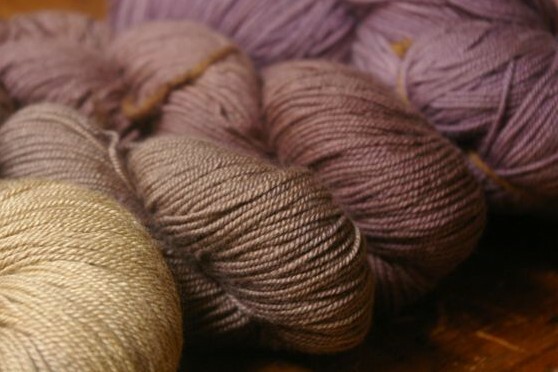 Beautiful colours, you are right overdyeing gives some excellent results. I absolutely love all of these! They’re so pretty together. Can’t wait to see what you make with them.